I’m a hat person. Each summer I buy two or three new hats. I’m always in search of the perfect hat—one that scrunches into my purse and unfolds miraculously into a perfect bonnet. My fear of skin cancer has driven me to contemplate using a veil, slits for the eyes. My skin doctor doesn’t believe in sunscreens. “Only hats with a ten centimeter rim… minimum,” he says, after scraping nasty cells off my skin like ketchup off a bun. Despite the pull of the veil, I shop for hats, a measuring tape always in my purse. But ten centimeters do not give me maximum shade. And a rim over ten makes me look like a walking wok cover. Seeking ultimate protection this year, in mid-June I bought a parasol. Whatever was I thinking? Fifth Avenue Easter Parade circa 1951? Champs Elysees circa 1925? Hadn’t the saleswoman mentioned Paris? Isn’t parasol a French word? But when I go to Tel Aviv every week, I go to babysit my granddaughter. We crawl on the floor in pajamas and read Good Night Moon in the afternoon. Who wants to go outside where the air is sticky and thick? And aren’t parasols supposed to be delicate and dainty? Mine is more reminiscent of a morning with Moloch than an afternoon by the Seine. Yet, I always take my parasol with me, closed in my red plastic shopping basket and leaning against a bottle of water, a book and fresh figs. Yes, I wear a ten centimeter rim hat and shlep the parasol. Never once this summer have I used the arty creation, neither in Tel Aviv nor Jerusalem. Perhaps it’s the vivid colors, the unusual design. Perhaps I need a third hand or a servant to walk next to me holding it above my head. Perhaps I need that white summer dress with a skirt that twirls. 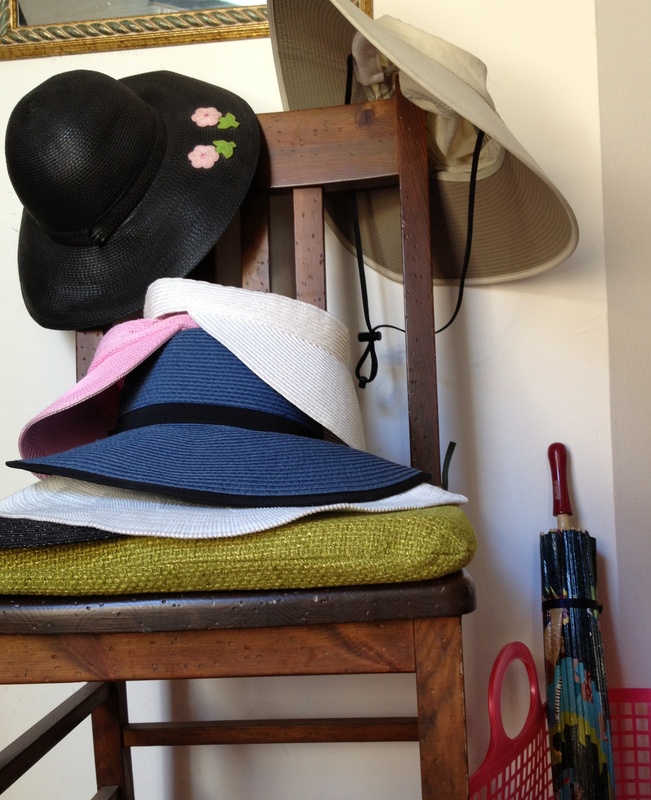 At home everyday the parasol stands at attention, reporting for service next to the hat chair. It has become a crazy prop rather than a means of protection. Maybe I will hang it upside down from a light fixture or open it and let it reveal its intricate inner parts. 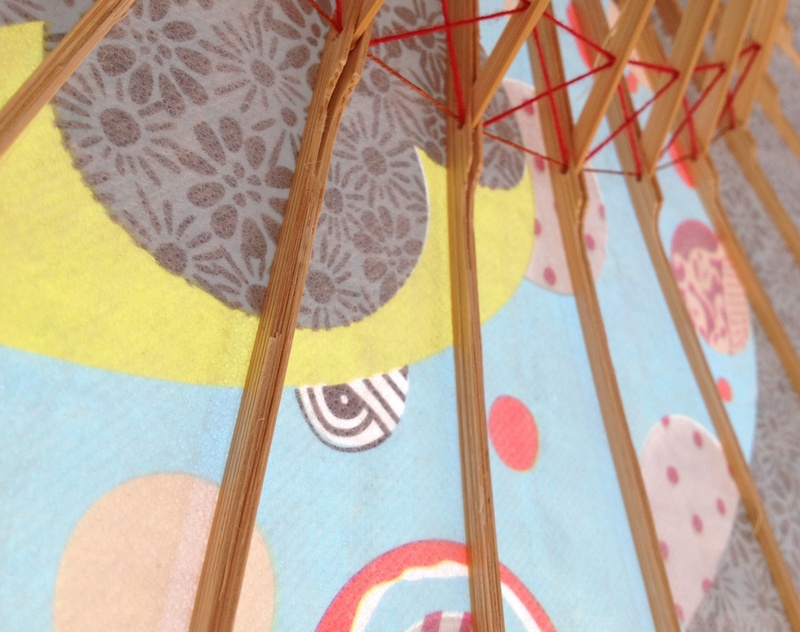 Inside the house it’s delicate slats will be safe from sudden winds. Its vibrant colors will be protected from the fierce rays of the sun, that old sun who just roll around heaven all day and damage our skin. This entry was posted in Bethlehem Road, Uncategorized, Walking and tagged parasol, protection from the sun, skin cancer, the perfect hat. Bookmark the permalink. The one perfect hat I ever had — a gift from a friend, which I managed to hang on to through about a dozen flights on a single trip — got left behind in the airport shuttle just as I was dropped off at my house. It was a lesson in “there is no perfect” and “sic transit omnia.” And I can understand why your parasol has become a dust collector. If we were meant to use parasols, they would sprout from our head as soon as we were old enough to walk outside by ourselves. Ahh, I saw a hat like that. It looked like it sprouted from the woman’s head. It was as if she were carrying or balancing a parasol on her head. That’s the solution, Esther. Someone will make a mint on the patent. Damn that loss of the perfect hat in the airport shuttle. I think you should get that white summer dress with a skirt that twirls. 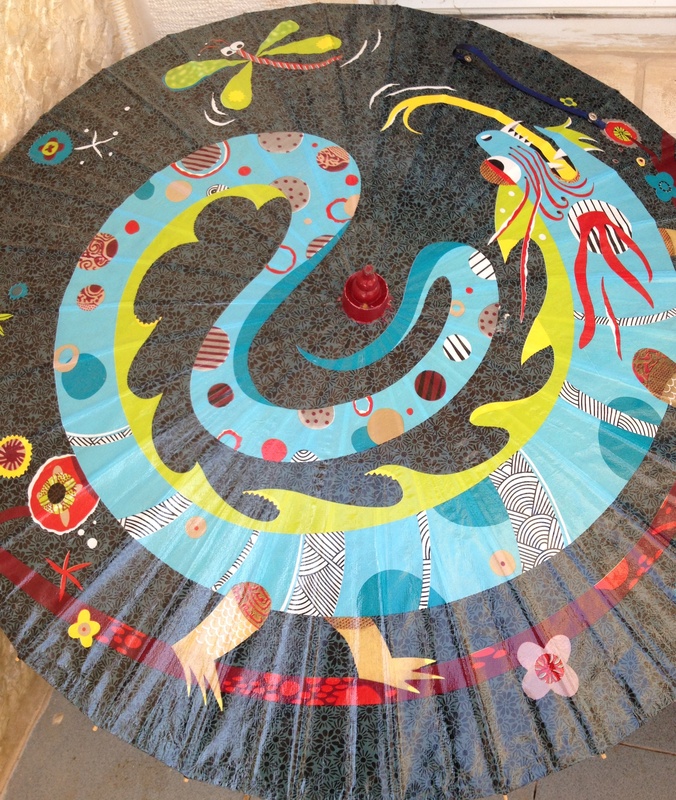 Then you’ll look perfect with the parasol. Don’t forget to post the picture! Thanks for the encouragement, Miriam. You’re simply in the wrong country. 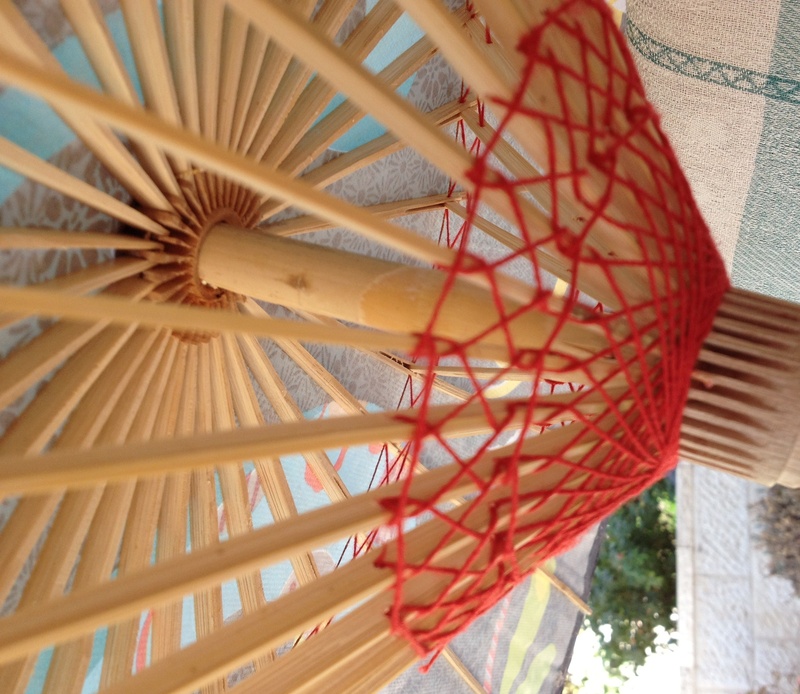 Parasols are quite prevalent in China and Japan. Perhaps you could try it out again on a trip to NY. Ahh, that’s my problem. I’m in the wrong country. Thanks, Bonnie, for letting me know. In my next incarnation I will make aliyah to Japan.